Ted Williams, nicknamed Ted “Golden Voice” Williams, is an American radio host and voice-over artist. In January 2011, with very few possessions other than a handwritten sign, Ted stood in the cold at a busy intersection is Columbus, Ohio. He was broke, homeless, fighting addiction and left standing on a corner trying to find a positive direction for his life. The former radio announcer was trying to piece his life back together. Ted’s dream of getting off the streets and back in front of a microphone came unexpectedly when a Columbus Dispatch reporter noticed his sign. Ted pleaded for help and boosted about his “God given gift of voice”. The reporter interviewed Ted and The Dispatch posted a video of “The Man with the Golden Voice” on YouTube. The Video went viral. This was the beginning of Ted’s return to a healthy life. Ted has received numerous and lucrative job offers since 2011. One of his 1st job offers came from Kraft. He has been the voice of Kraft Mac and Cheese since 2011. Ted landed a book deal in 2012.It was titled “A Golden Voice: How Faith, Hard Work and Humility Brought Me from the Streets to Salvation”. Pepsi used “The Golden Voice in their new ad campaign. This campaign was going to be huge and would be aired during the Super Bowl. Ted Williams has had some struggles along the way but feels truly blessed beyond measure. With all the success he has had since 2011, Ted wants to “Play It Forward” by helping the community that he was very much a part of. 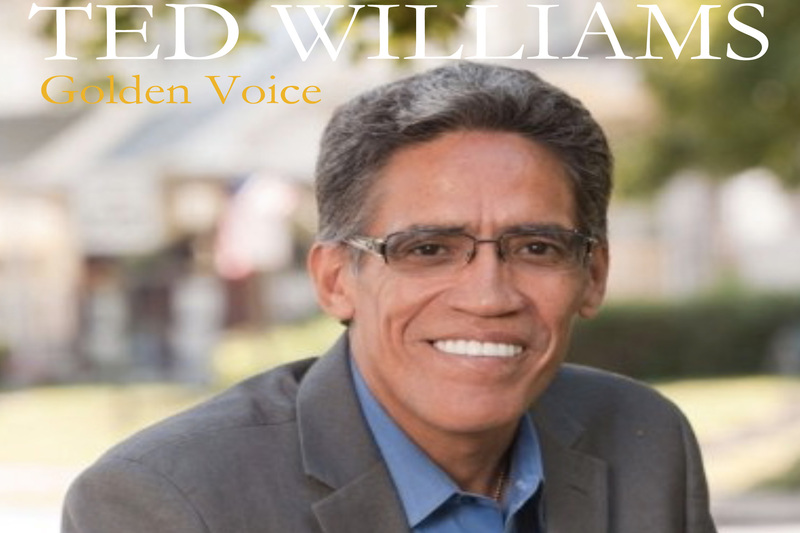 He is the founder of the Ted Williams Project, a non-profit organization serving homeless shelters. AMPS: Where were you born and reared? Ted: I grew up in Brooklyn, New York. AMPS: What was it like growing up in Brooklyn? Ted: I’m an only child. I was adopted when I was three weeks old. Myadopted parents are African-American. I was different. I did not “fit in” in any culture according to my peers. I did not fully understand my ethnicity. All I knew for sure was that I loved my parents. They were the only parents that I knew. They were beautiful people. AMPS: How did you handle peer pressure in school? Ted: I had to finally understand that my schoolmates did not determine my substance. They teased me about the color of my skin and the texture of my hair. They did not try to get to know me as a person. My outside appearance is not a reflection of the person within. As kids often do, I started to fight back. I defended myself. I have tried to instill the strength of self –worth in my grandchildren. They need to know that self-worth is not the result of one’s appearance. AMPS: What events in your life led to homelessness, drug addiction and alcoholism? Ted: Early in 1980, I was doing very well with my broadcasting career. I had started my family. I had four daughters. Life was good for me. In 1988, my son was born. I was beyond happy. In celebration of the occasion, I decided to smoke some marijuana. Without my knowledge, crack-cocaine was mixed with the marijuana. I liked the feeling that it gave me. Believe it or not, I was hooked from the beginning. I went on a rampage trying to buy all of the crack-cocaine that I could find. The rest of the story is a downward spiral. I could never have imagined that this drug would control my life. AMPS: Did the use of crack-cocaine lead to you living on the streets of Columbus? Ted: Absolutely. My priority became finding my next high. It separated me from my family, my job, my home and many other positive things that were in my life at that time. I was embarrassed and I embarrassed my family. My voice was a gift from God and I was abusing it. I feel truly blessed that I still have “The Golden Voice”. I give all praises to God for standing with me through my struggles and carrying me when I could not go any further. AMPS: At what point did you decide to change your life? Ted: It has been a journey encompassing many years. It was a process for me that included changing my mindset and my environment physically, emotionally, psychologically and spiritually. I would get clean, stay clean for a while and relapse into old habits time and time again. I became known as the “Relapse King”. My “Saving Grace” was me being exhausted and fatigued from the drugs and alcohol. I was finally ready to commit to the lifestyle change. The Columbus Dispatch reporter was instrumental in changing my life. Because of his actions, I was given an avenue to make the change that saved my life. AMPS: What did you do personally to initiate the lifestyle change? Ted: Even in the dark days, prayer has always been a part of my life. I decided not to pray for favor in my life. I wanted to pray for my mother and my children. I wanted a more sincere relationship with God. I was more concerned with the lives of my family. I had neglected them. I felt that putting others before myself would start to create the relationship I was seeking with God. AMPS: Most people would pray for God’s intervention in their life’s struggle. Why didn’t you pray for God’s favor in your life? Ted: It’s very difficult to explain my thought process at that time. I just felt there were so many challenges that I was facing. My way of asking for forgiveness was to pray for those that I had abandoned. AMPS: What is your relationship with your family now? Ted: Because I am healthier in terms of my drug addiction and my alcoholism, the relationship with my family is evolving. My children still have some unresolved anger and resentment issues, but we are working on them. They want to believe in me and to believe that I have turned the corner. I am working on my sobriety every day. I realize and I want my family to realize that I cannot make up for lost time. But going forward, I want to be the best father and grandfather I can possibly be. Recently, my family and I had an impromptu family reunion in my hotel room. All of my children and grandchildren were there. We spent several hours together. We ate good and laughed with each other. It was the first time that we had been together in a couple of years. It was truly a blessing and I know that we are on the right path of becoming whole. AMPS: What is the premise of your book? Ted: The title of my book is “A Golden Voice: How Faith, Hard Work and Humility Brought Me from the Streets to Salvation”. The book chronicles my journey from childhood. I explore my insecurities of being adopted. I recognize generational abandonment within my journey. I was abandoned as a child by my biological parents. Fast forward, I abandoned my children because of my addictions. I discover my lack of appreciation for my adopted parents. They were great parents to me. My book allowed me to delve deep within myself and come face to face with the baggage that I carried for so long. It was therapy for me. I am now in a better state of mind. I do not live in the past. I’m only looking at the present and to the future. AMPS: You were adopted as a baby. At what age did your parents discuss this with you? Did you understand the meaning of adoption? Did you look at your parents differently? Ted: I was around six or seven years old and I was crushed when I found out I was adopted. Curious as most young boys are, I had begun to wonder why I looked different from my father. I finally asked my Mother “why”? It was then that my parents set me down and explained “adoption” to me. I knew that my adopted parents loved me and I loved them but this was a lot for me to understand. I later found out that my friends and their parents knew my truth but they did not tease me about adoption. AMPS: What projects are you currently working on? Ted: I’m working a fitness regimen in preparation for an upcoming demanding schedule. I will be shooting episodes of a TV reality show. I am still the voice of Kraft Macaroni and Cheese commercials. I’m also traveling to speak with youth in schools and to give my testimony at church events. I will be the voice for an audio version of the Book of Revelations from the bible. I’m also doing children’s books. I’m having the time of my life!!! AMPS: Who is your inspiration? Ted: My inspiration walks on water. AMPS: What would be your “Do-Over” in life? Ted: One of my biggest regrets is not being there for my children. I would be the father that they needed and deserved. I would have a personal relationship with God. When you give all praises to God, his favor shines in your life. I would be the husband that pledged before man and God “to love in sickness and in health, for richer or poorer, ‘til death do us part”. AMPS: Who is your support team? Ted: My manager, Scott Anthony, is awesome. He takes care of my career and expanding my brand. He understands the business so I leave it in his hands. AMPS: What advice would you like to leave with the AMPS’ family? Ted: First and foremost, you must acknowledge God in all things that you do. Be grateful for the simple things in life. Keep prayer in your life and continue to build your personal relationship with God. Monroe’s Very Own BJ Bell.